Describe the complementary relationships between pollinators and the plants they pollinate. Identify adaptations that flowers have developed to "encourage" pollination. Copies of Activity Pages 3A and 3B and the Take-Home Page. 1. Begin the lesson by explaining that over time flowers have developed adaptations to ensure that the best pollinator (one that will carry pollen onto another flower of the same species) will return again and again. Pollinators such as hummingbirds and honeybees have also adapted to ensure that they will have a plentiful food supply. The trumpet flower is red in color, has an upside-down "tube" shape, has no "landing" spot, and has little fragrance. Hummingbirds have a poorly developed sense of smell; are attracted to the colors red, pink, orange, and yellow; "hover" at, rather than land on, their flowers; and have a long bill and tongue. Honeybees have a short proboscis, cannot see red, must land and crawl, and are attracted to sweet fragrances. 5. Have your students pair off. Instruct them to state their preferences, which they've listed on Activity Page 3B. Then have each of them draw simultaneously their partner's "designer flower." For fun, have them make it as unreal as possible. For example, one might design a flower that is black, triangular in shape, smells like fresh-baked brownies, and provides pizza as a reward. Have each pair present their "designer flowers" to the class. 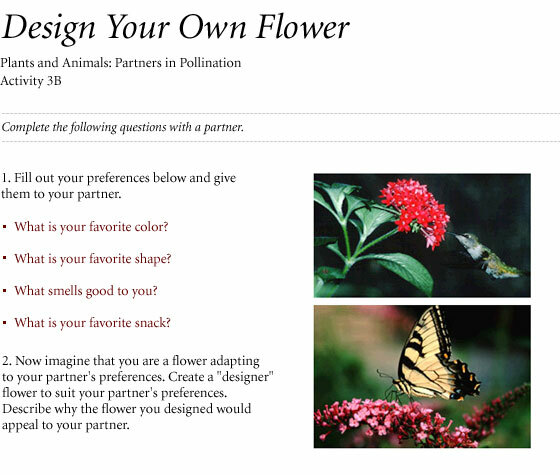 As an extension, have the artist be the flower, designing "adaptations" suited to his or her partner's preferences. 6. Direct your students to the Take-Home Page. Tell them to think up and draw a fictional pollinator-plant pair. (For example, a flower that smells like Swiss cheese would likely attract a rodent pollinator.) Remind students that the goal is to get the animal to pick up the pollen and carry it to another plant of the same species. Have them list the attributes of the plant that attract the pollinator and the mechanism or mechanisms by which the pollinator carries the pollen to the next plant.